Polish leaders planning to defend U.S. withdrawal from the Iran nuclear deal within the European Union. Polish leaders are planning to defend the U.S. government's withdrawal from the Iran nuclear deal within the European Union, The Associated Press reported Tuesday. 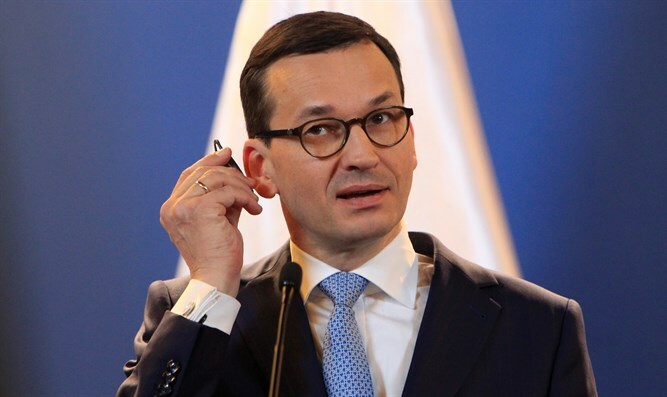 Polish Prime Minister Mateusz Morawiecki said, according to the report, that Poland wants to be an "informal go-between" and to explain to EU members and U.S. officials the positions of the other. The Polish government's mediation offer departs somewhat from the united front EU leaders displayed last week. Trump announced earlier this month that his country would pull out of the accord struck in July 2015 between Tehran and major world powers. Polish Foreign Minister Jacek Czaputowicz said Monday during a visit to Washington that Poland stands with the rest of the EU in seeking actions to limit economic damage from the Trump administration's move, "while as for the strategic and security dimension, we also understand the U.S. concerns." Also on Monday, the EU's foreign policy chief, Federica Mogherini, warned that there is "no alternative" to the Iran nuclear deal, after U.S. Secretary of State Mike Pompeo vowed that Washington would impose unprecedented sanctions against Tehran.